AND AUTHOR OF "LIFE IN UTAH," ETC., ETC. May 7th.----At 7:30 A. M. I boarded the cars of the narrow gauge Denver and Rio Grande R. R. ----- familiarly known here as the "Narrow Gouge," in delicate satire on its rates of fare. Ten cents a mile does look a little steep for a Railroad, but consider, that before this was built the tariff was twenty cents a mile by stage; that the road is not assisted by grants or subsidies; that the amount of travel is too small as yet to pay expenses; and that the question is, whether you are willing to pay half stage fare for the luxury of a car, or go back to the old style. I only wish I could go all the way to Santa Fe by such carriage, for I do dread the three hundred and twenty -five miles of staging. Denver, Colorado flour is $14.00 per barrel, "State flour" is only $10.00. About 10 A. M., we leave the Platte and follow up a small stream to the "Divide." Here we are in a lumber region, as shown by the immense stacks of the same about the depots. Singularly enough, Near the “Divide” on both sides are considerable fields cultivated without irrigation, there being sufficient cause accounts for all three, I don’t know which. If this theory is not scientifically correct, Quien Sabe? As soon as we pass the summit and get on the head-waters of the Fontaine Que Bouille, we see on all the slopes immense herds of cattle and sheep. At Colorado Springs lives one man who has 13,000 sheep in this region; and I am reliably informed that there are 150,000 head of stock in the system of valleys opening out on this stream. The country is evidently one of the best in the world for sheep. It is high, dry, cool in summer, and not very cold in winter, with just moisture enough to produce good grass. For about fifty miles we traverse a beautiful grazing region. At the Springs we stop an hour for dinner. Here is one of the coming towns of Colorado, having a fine fertile valley, immense grazing area, and the noted chemical springs---already a great place of fashionable resort. I am most agreeably surprised by Southern Colorado. There is very little desert, and except the bare mountains it appears to me a country of great natural richness. The valleys are very fertile, and most of the slopes furnish good pasturage. The railroad terminates at little Buttes, ninety miles from Denver; and there we take the stage. Nineteen passengers go on to Pueblo, which we reach sometime after dark, and all stop there except Captain H. H. Humphreys, of the fifteenth United States Infantry, his wife, his servent, and the subscriber. I am the only through passenger, the others go to Fort Union, New Mexico, and we travel together some forty hours. A night ride in a coach is not a subject for poetry. Ours is as comfortable as the average. May 8th--We breakfast at Cocharas, an old-style Mexican hacienda, in a beautiful circular valley, 70 miles from Little Buttes. 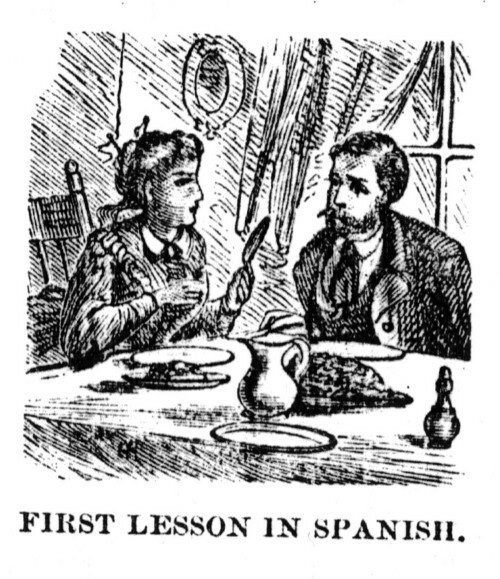 I am still fresh as at starting, and make havoc among the wheaten-cakes, fried eggs, and chopped and stewed mutton, which, with coffee, constitute our breakfast: called here, however, tortillas, huevos, carne, and cafe respectively. A plump and pretty senorita sits by and gives me my first lesson in Spanish, with a pleasing variety of smiles and graceful gestures. She is a most persistent teacher, and will not rest until I have learned the name of everything and that the table beginning with myself I am un Americano, also un Caballero, she ventures to hope, with a pleasing smile, that makes me perfectly willing to; and when neither of these, I am simply un hombre, "a man." The knife I eat with is un cuchillo, as she writes it in my book, but by some lingual gymnastics, they pronounce it coo-chee-o. My chair is una cilla (see-a), my head is cabeza (cah-bayza), and she wonders I have not mal de cabeza from a night's ride en el carroza; my eyes are los ojos (o-hose), the table is la mesa (may-sa), and she hopes we may part amigos. As was the case at times where I have been." We are off for another day’s ride, with the celebrated “Fat Jack” for driver, Ten Years before “Fat Jack” lived on Dayton Street, Cincinnati, and might have traveled as the “Original Living Skeleton.” Some unnameable and wasting disease had reduced him to less than ninety pounds weight. He started West, began to improve, reached New Mexico, and went to driving stage, and now weighs two hundred ! He is five feet four inches high, and four feet two inches around the waist. My essay at Spanish amused him, and he told me, when I reached Santa Fe, to procure at once una diccionaria dormiente---“a sleeping dictionary;” but as he accompanied the remark with a fearful facial contortion, and a poke in my side that nearly dislocated a rib, I take it he meant a joke, though I cannot imagine where the point is. The morning air is quite cool, but the afternoon warm and pleasant. The scenery is grand. To our right are the Spanish Peaks, in front of Fisher’s Peak, of the Raton Mountains; both glistening white with snow. The last named looks as if it were about five miles distant.